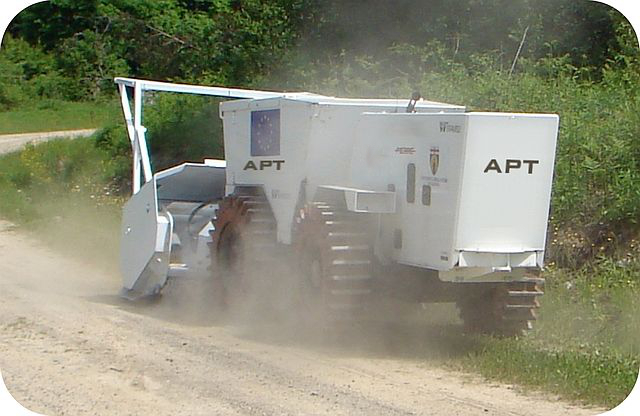 The Area Preparation Tractor (APT) is an area preparation machine that can save demining organisations time and money while increasing safety for everyone in the field. 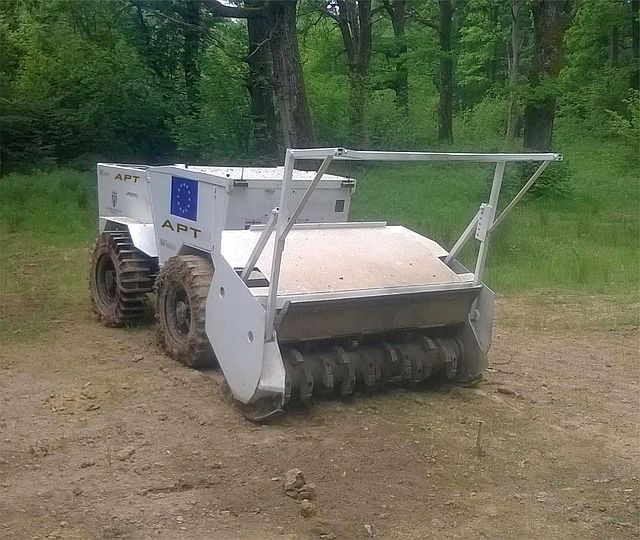 APT derives from the demining machine completed within the European project TIRAMISU. The base machine is a small and powerful vineyard tractor that has proven robust and reliable over many years. 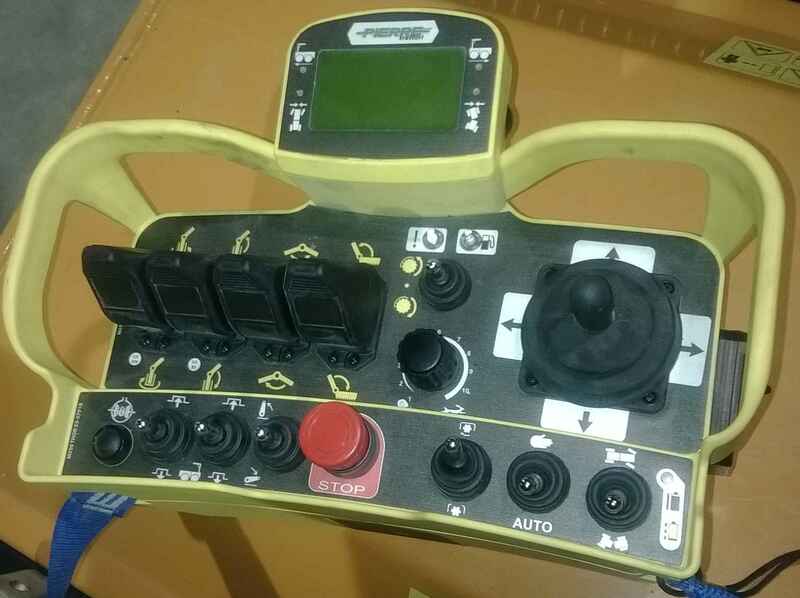 We have added industrial remote controls, innovative blast resistant wheels and armouring, but left it possible to drive the machine conventionally when required. Small and very powerful (80+HP), the APT can power a wide range of tools while climbing steep slopes and weaving between trees and other obstacles, so it is perfect for preparing the ground in advance of manual deminers over almost any mined terrain. The mulcher attachment that we provide is built around a popular agricultural implement that has proven strength and durability. Blast-resistant, it can easily cut undergrowth up to 10 cm in diameter or process the ground surface to depths up to 8 cm when that is desired. Remotely controlled, the APT-796’s articulated chassis makes it incredibly manoeuvrable. 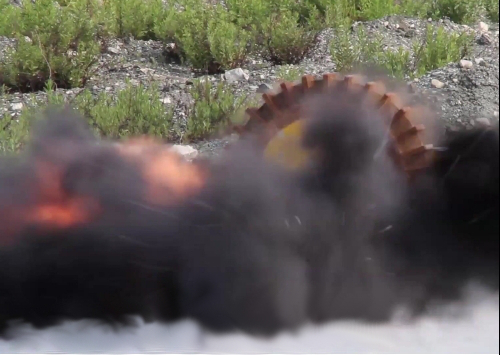 Its blast resistant wheels can take multiple AP mine detonations without a problem and its armouring protects against the frag associated with fragmentation mines. Recent independent tests in Croatia confirmed its ability to withstand multiple blast mine detonations under mulcher and wheels – and bounding fragmentation mines at close quarters. As an area preparation machine APT-796 is not designed to detonate mines, but when it does, the machine keeps going and it can be very useful to know where the mines were! > APT-796 is not designed to withstand the detonation of AT mines and has not been tested against them. > The 100% reliable remote operating range of the machine is 200 metres. It actually works at greater distances and it automatically shuts down if radio contact is ever lost. To get to the worksite, the manual controls remain in place so the machine can be driven over roads at up to 37 kph. Lights, brakes and driver protection make APT road legal in Europe, so it can be registered for road use in most countries. To prevent any damage to the road surface, the machine is supplied with two sets of wheels, four traditional pneumatic wheels and four blast resistant wheels. An easy jacking system makes changing wheels simple. When transporting itself from site to site, the APT can pull a trailer carrying tools, equipment and consumables. To deploy over large distances, it is advisable to use a transportation vehicle. Fuelled up and ready to go, APT weighs 3500 kg. The mulcher attachment weighs another 1200 kg. Because APT is able to climb steep ramps, many kinds of transportation vehicle can be easily used. > Although APT-796 is new, the base machine (the agricultural tractor P796V EVO) and implements have been proven durable and reliable over many years. > Simple operator training is complemented by simple instructions for both operation and routine service. APT-796 is a reliable and proven multi-purpose system designed to be used in demining operations. And when the demining is over, it can be simply converted for traditional agricultural activities that make use of the cleared land. It can plough or rake the ground as well as cut vegetation and help harvest crops. Its power-take-off can also be used to power rice-mills, flour grinders or generators. So APT is the first demining machine that has been designed to be converted to peace-building uses when no longer used in mine action operations. Organisations seeking to empower local communities and help rebuild rural economies after conflict should find its relatively low-cost and high versatility attractive. 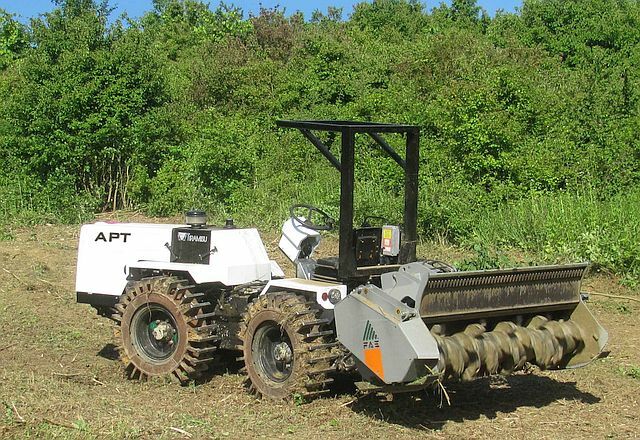 For any organisation working in demining to build peace, APT-796 is an affordable asset. With its blast-resistant wheels fitted, APT-796 is 4 m long and 1.5 m wide. With the mulcher attachment fitted, those dimensions are 4 m long and 1.9 m wide. Its articulated chassis complements its steering wheels to allow the machine to turn in a circle of radius 2.8 m. The proven chassis is strong enough to allow the use of heavy attachments. APT-796 is so named because it is built on the well proven P796V EVO agricultural tractor. A range of engines are available with the standard model being the KDI2504TCR manufactured by Kohler. This is an energy efficient, low-emissions unit with long service intervals and well proven performance. Other engines can be fitted to other models. A standard, category I, three point linkage attachment at the rear allows hydraulic lifting and positioning of most COTS agricultural tools. Power to the primary attachment is drawn from a power-take-off (PTO) at the rear of the tractor. An infinitely variable gearbox means that the tractor can be driven in either direction at any speed, so the PTO can be used to carry tools at the front or the rear during use. An additional hitch at the front allows a secondary attachment to be powered hydraulically. Effectively, APT can have two three-point-linkages and use two tools at the same time. Another hitch allows light tools to be attached to the side so supporting the attachment of, for example, large loop detector arrays for use during BAC. Designed with engineers from the University of Genoa and independent demining specialists, our wheels have been subjected to many tests and iterative refinements. The end-result is deceptively simple and very effective. The wheels are designed to withstand AP blast mine detonations and also absorb the shock so that the bearings and axles are not affected. Charges up to 280g TNT were used during development and independent tests at CTDT in Croatia have confirmed that we have achieved our design aims. point linkage lift, and the PTO shaft. The operator controls APT’s attachments using a set of four unidirectional proportional joysticks. The LED indicators and display that are mounted on the RC transmitter provide feedback information including indicating which steering switching modes are active, engine parameters, working parameters, warnings and alarms. Co-funded by the European Community's Seventh Framework programme (FP7/2007-2013) under grant agreement nr: 284747 (TIRAMISU).